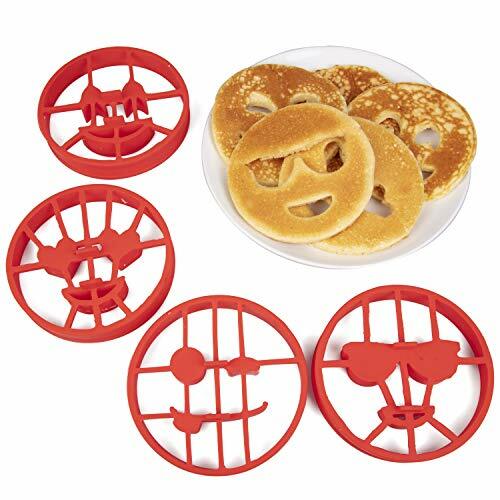 EEmoji Pancake Molds and Egg Rings (4 Pack) for Kids AND Adults - Reusable Silicone Smiley Face Maker Doubles as Cookie Maker Set- FDA Approved, BPA Free, Food Safe, Heat Resistant Silicone: This set of 4 silicone emoji pancake molds are great for turning any breakfast into a special reason to smile. Choose from heart eyes, winky face, cool sunglasses or just plain happy face and add a sparkle to your breakfast. Fried Egg Mold- Use for both pancakes and eggs!